Mane breaks Premier League record as Liverpool put pressure on City! The Senegalese scored his 17th Premier League goal of the season to help his side go above Manchester City. Liverpool left it late at Fulham to move back top of the Premier League. The Reds overtook Man City after James Milner’s late penalty sealed the three points. It had been a nervy afternoon in West London after ex-Liverpool forward Ryan Babel second half equaliser cancelled out Sadio Mane’s opener. But Milner would keep his nerve to score after Mane was brought down in the area, sending the Reds top. Not only Liverpool went ahead of City but Liverpool star Sadio Mane set a new record in Premier League. 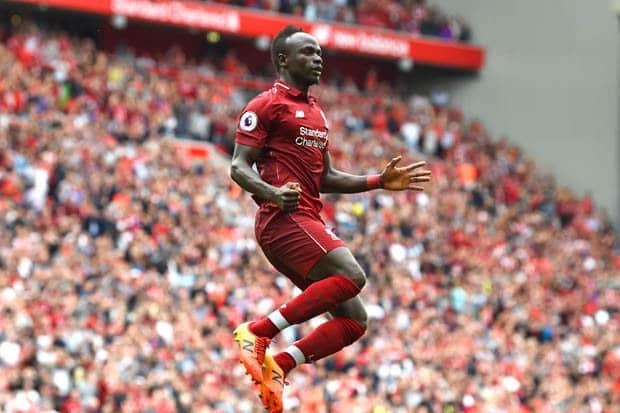 Sadio Mane has now scored the most goals in a Premier League season by a Senegalese player in the history of the competition, after notching his 17th strike of the season against Fulham on Sunday The 26-year-old has scored 11 goals in as many game in all competitions to keep the Reds in contention for silverware at the end of the season. Mane helped the Reds to a 2-1 win at Craven Cottage and continued his own fine season as Liverpool moved top of the English top flight. The forward has now surpassed Demba Ba’s record of 16 goals for Newcastle in 2011-12, and his own effort of 10 league goals last term. He has also drawn level with Harry Kane, Piere-Emerick Aubameyang and his team-mate Mohamed Salah on 17 goals to put him joint second in the Premier League top scorers list. Since the turn of the year, Mane is the joint top-scorer in the division with nine goals – a record only matched by current Golden Boot frontrunner Sergio Aguero. The 26-year-old has been particularly aided by his understanding with fellow Liverpool forwards Salah and Roberto Firmino, with the trio creating a devastating attack in the last two seasons. They have certainly combined consistently in the last few weeks as every one of Firmino’s last seven Premier League assists have been for one of his strike partners, the Brazilian setting up Mane again in west London on Sunday. Those goals have helped the Reds extend their unbeaten Premier League run to 10 games now. The run stretched back to January 3 when Jurgen Klopp’s team were beaten 2-1 by title-rivals Manchester City at the Etihad Stadium. Mane has found the net at least once in seven of those matches and has five goals in his last four league appearances. Jurgen Klopp will consider playing James Milner, who netted from the penalty spot against Fulham, in an advanced role due to his record of never having lost a Premier League game in which he has scored for Liverpool. Klopp will be hoping his striker can maintain that form for a run of three tricky matches for Liverpool after the international break. The Reds face home games against Tottenham and Chelsea with a visit to relegation-battlers Southampton in between. Pep Guardiola gives his view on lack of VAR used in F.A Cup!